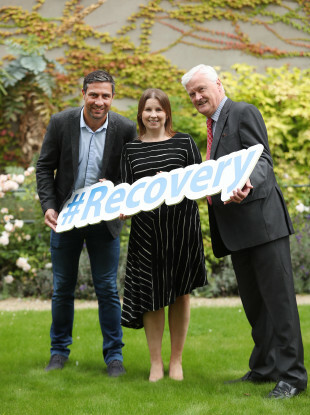 Kenny Egan with Maebh Mullany and Dr John O'Connor at the launch of recovery month. AS PART OF its 40th birthday celebrations, the Rutland Centre is looking for some of the 10,000 who’ve passed through its doors since 1978 to tell their story, to help those suffering from addiction to come forward to seek help themselves. The addiction treatment centre wants to then share these stories of others as part of Recovery Month this September. Last month on TheJournal.ie, we shared the story of Stephen. He almost lost his family through an addiction to cocaine, before going for treatment at the Rutland Centre. The Rutland Centre now wants to tell stories like Stephen’s to help inspire those who may need to reach out for recovery. Its chief executive Maebh Mullany said that, when the centre opened, the addiction it dealt with was mainly alcohol but that has changed significantly in recent years. She said: “Alcohol addiction remains a constant problem in our communities unfortunately but we have also seen, especially in the last 10 years, the growth in prevalence of new addictions such as gambling. Traditionally, it was mainly men who we saw presenting for treatment. These days, we see men and women of all ages, often presenting with multiple addictions. Mullany said that the centre wants to help change the stigma associated with addiction, and can do that by telling the stories of others. The centre is looking for letters, emails, video clips, phone calls, social media messages and others for this project. Mullany emphasised that while no stories would be shared with third parties without prior consent, the Rutland Centre may wish to publish stories on its website or in the media. People can tell their story by contacting the Rutland Centre on Facebook, Twitter or by contacting Mullany on 01 4946358 or MaebhMullany@rutlandcentre.ie. Email “10,000 through the doors in 40 years... and the Rutland Centre wants to inspire others with their story”. Feedback on “10,000 through the doors in 40 years... and the Rutland Centre wants to inspire others with their story”.